Today, marks the fateful anniversary of September 11, 2001, a day that changed not only thousands of affected families lives, but the collective life of an unconscious nation. Nineteen terrorists and 4 commandeered airplanes created loss and havoc in their lives, their families' lives and our lives, forever. It was the wake up call heard around the world. One whose repercussions we had not yet heard, or even felt. One which was misunderstood, misinterpreted, and misjudged. But it doesn't matter who fires the shot, throws the first stone, pilots the airplanes, or even what specific cause or religion or rationalization is used for creating death and destruction. Yet, from that awful and deeply connected pain came the most amazing and universal feeling of genuine good will, pride, and patriotism that those of us in the U.S. had felt in a very, very long time. In honor and in memory, I think of that event, of those losses of that tragic day in history and in that memory, I created a healing quilt. Titled 'Rose Colored Glasses', it is my way of making lemonade out of lemons, joy out of sorrow, peace out of war, and healing out of the collective subconscious sea of pain. Made up of patches of many colors, many shapes, many sizes, and many differing choices among them, it represents the community of many who are different coming together to create a whole that is stronger than the sum of its parts. So, up front (quilt front) we may appear as the disparate many, but we are backed up (quilt back) by a unified body of one. The twin towers may be no more, but the unified power of one towers above, about, and around us all. Like quilts made in honor of those who had died of other national tragedies and disasters, from disease or famine or quilts made in memory or recognition, my simple little quilt is just for me. Something to pour my own healing energies into, to combine the colors of my heart chakra with the colors and frequencies of change, momentum, and hope into something whole out of many things separate. 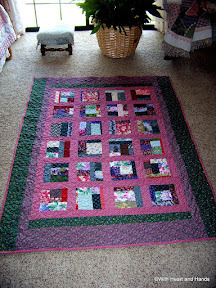 I named my quilt "Rose Colored Glasses" because that is the positive energy of hope, of change, of unity, and of healing. Not in a dreamy, overly optimistic way, but with the creative force of intention, will, desire, and action. If we can change the way we see the world, the way the world sees, will change as well. A new vision, a new clarity, a new direction for in-sight. Today, I think of all of those many and varied parts and pieces that created 9/11. All of those who lost their lives and all who loved them. And I am grateful to them for what they gave to all of us with their deaths. There are many who say they are all our angels now. Maybe, they truly are, and maybe the angelic order doesn't actually work that way. It doesn't really matter. What matters is that they sacrificed their earthly lives and created a universal opening in our national consciousness. And for that I am deeply grateful. This year the annual commemoration of the attacks in the US has been given a new name - the National Day of Service and Remembrance. President Barack Obama and his wife Michelle have called on Americans to carry out community service as a way of honoring the heroes of that dark day. "Rose Colored Glasses: Visualize Healing a Unified Heart"
That is the most touching post I've read on blogs today about 9-11. Your quilt is beautiful. Nicely written. Years ago when I was a teenager I lived in Panama City, Panama and being young, I was under the false pretense that I was safe simply because I was an American. I learned very quickly how wrong I was. Now that I'm older, I've learned being an American almost makes me a target if I'm traveling to another country. Thank you for sharing your thoughts and the meaning of your quilt commemorating this day. I hope and pray that our positive thoughts have an affect "out there". How wonderful, thank you for this post. I love your quilt, but mostly your thoughts and love behind the quilt...they are so special. Our quilting group at the hospital felt so helpless and lost on 911, for about a day...then we got with it, made an entire quilt in SIX DAYS! and raffled it off. We were able to send over $1000 to one of the fire crews who lost so many fireman in the towers. We wanted to help the children of these brave men, as most of them were young family men. I am crying as I write this. May we never again see such a dark, horrible day. This is so beautifully written. I'm sorry I didn't read it much sooner. You just amaze me how you get me to actually feel your words as I read them. Thank you for this!